Ready or not, here comes Utah’s future. 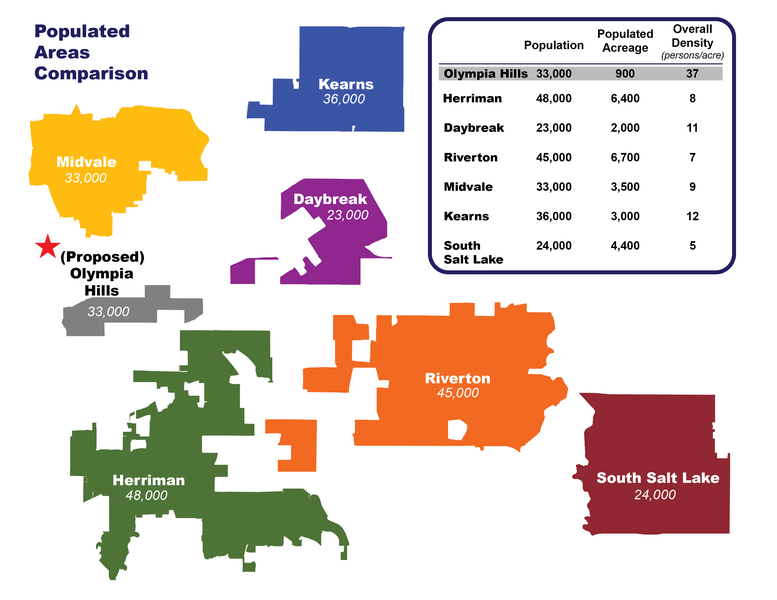 An expected doubling of the population in coming years with rapid growth largely concentrated in southern Salt Lake and northern Utah counties means less farmland, fewer sprawling homesteads and more high-density housing — much more. A new planned development in southwestern Salt Lake County — described as akin to the Daybreak subdivision — won approval Tuesday despite the seemingly united opposition of local municipal leaders and residents. County Council members OK’d the needed zoning change 7-1. The Olympia project proposes 8,765 units in a 938-acre parcel — making it the densest housing in the area, said mayors and city council members from neighboring cities. “The sheer number of units in the development is nothing short of overwhelming,” wrote the mayors of Herriman, Riverton, West Jordan and Copperton Township, who jointly called for the County Council to deny developers’ request for a zone change from agricultural to planned community, a mixture of homes and commercial. They worry about traffic, a strain on water, sewer and roads, and loss of open space. Riverton Mayor Trent Staggs said he was unaware of the proposal until last week, although it has gone through the county planning process for some time. He identified increased traffic on roads not large enough to handle it as his top complaint and asked that the density levels be cut by half or more. Opposition from local elected leaders was echoed Tuesday by the public. County Council members expressed sympathy but also said Utahns need to face the reality of the state’s exponential growth. Councilwoman Jenny Wilson heartily agreed. “We need density,” she said, pointing to explosive population projections. “I feel excited and good about it. Olympia developers’ plan calls for 4,783 apartments, 2,485 town houses and 1,497 single-family homes on quarter-acre lots in the area between 6300 and 8500 West and 12400 to 13100 South. The proposal envisions up 500,000 square feet of retail and office space and a 100-acre Utah State University campus, around which the most dense apartment-style housing would be clustered. “It is master-planned as a whole development. It is not going to be piecemealed,” Jensen said . He pointed to the coming economic expansion in the so-called Silicon Slopes area and the expected thousands of newcomers who will need places to live. Millennials “don’t want single-family homes anymore.” he said. The lone council voice against the plan was Steve DeBry. “How can we in good faith ... jam it down the throats of Riverton, South Jordan, Herriman and Copperton?” DeBry said. “Why can’t we slow down and address the issue with [local residents and leaders] so they feel good about us as their representatives? Councilman Arlyn Bradshaw, though, fought back against the idea expressed by some that high-density means more crime, loss of privacy and overall less desirable communities.